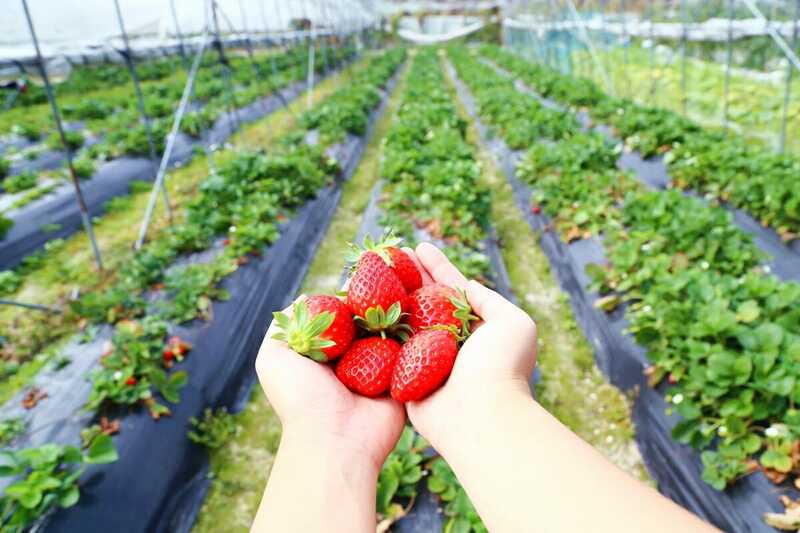 Hong Kong is home to several organic farms where you can go strawberry picking - read on for a fun-filled Hong Kong day trip! Though Hong Kong has some of the absolute best restaurants in the world, the vast majority of the produce available in Hong Kong is imported. While it’s true that you can get pretty much anything you want in Hong Kong, take a walk through any supermarket in the city and you’ll balk at the price of produce (and don’t even get me started on the outrageous prices for organic or non-GMO food). But things are changing, and the demand for locally-grown, organic produce is on the rise. If you’ve read some of my articles in the past on what you should know before visiting Hong Kong, you’ll know that while Hong Kong is almost always thought of as a concrete metropolis, in reality about three-quarters is countryside. This has given rise to a number of homegrown farms that have sprouted up just outside of the city, many of which you can visit to pick your own fruit and vegetables! We loved our visit to the Rainbow Organic Strawberry Farm – it’s a great day trip for adults and children alike, and the strawberries are gobsmackingly good. 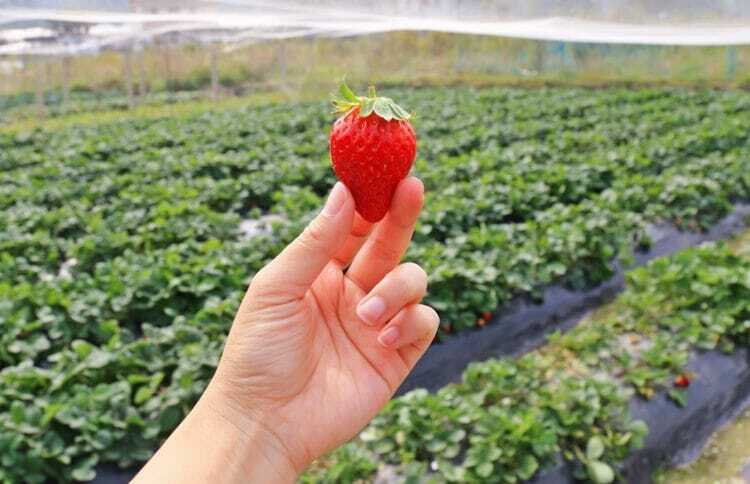 If you’re looking for a fun-filled day trip, try your hand at strawberry picking in Hong Kong! Looking for other easy Hong Kong day trip ideas? Head on over here! 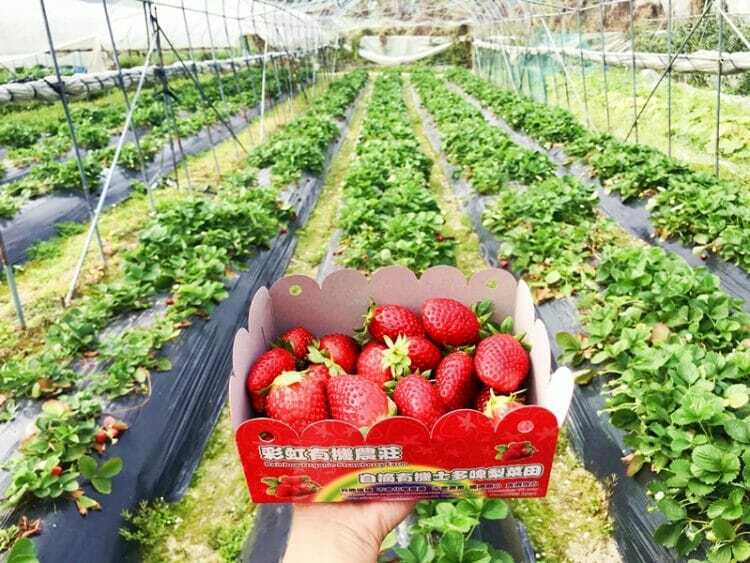 Rainbow Organic Strawberry Farm is one of the oldest organic farms in Hong Kong and is located in Fanling, about an hour by car from Hong Kong Island. I drove there as there is free roadside parking, but you can also catch public transport – hop on the MTR to Fanling Station (2-3 train changes depending on where you get on), and then either catch the 52B minibus or a taxi. 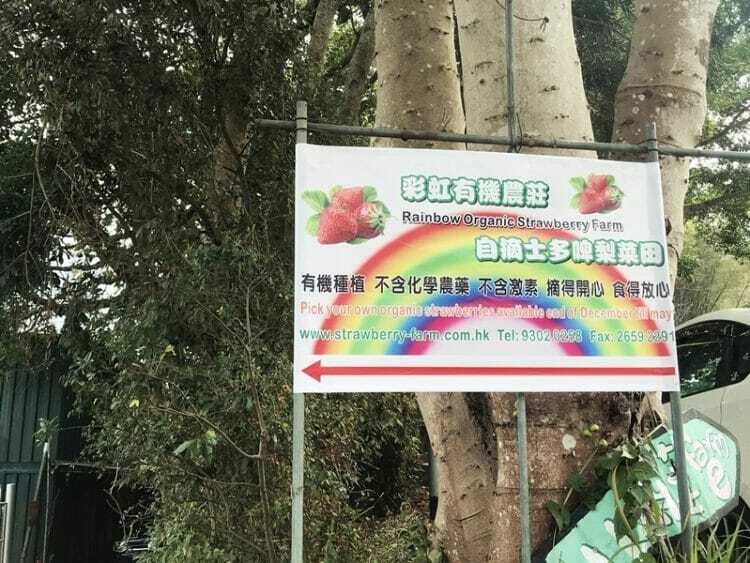 If you are taking public transportation it will take you closer to 2 hours to get to the organic farm in Hong Kong – follow this sign off the main road to find the strawberry farm. Want to pick strawberries in Hong Kong? 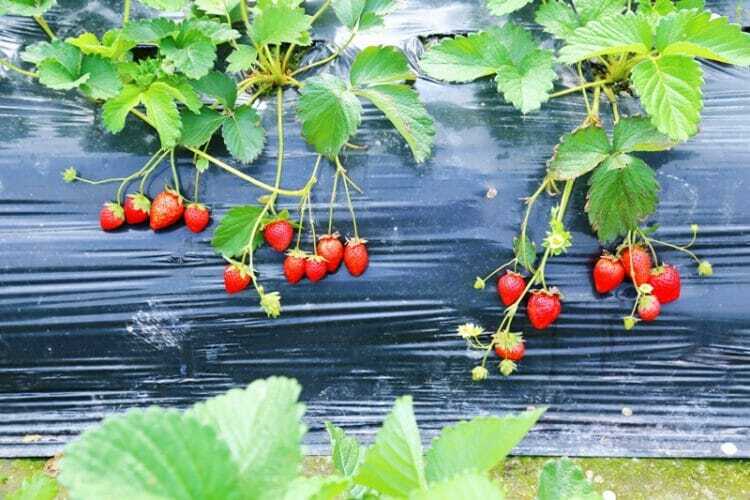 Strawberries are only available from mid-December to April, so if you’re visiting on either end of the season you should get in touch with them to ask if strawberries are available before schlepping over to Fanling. As we have had a fairly warm winter so far, the first crop of strawberries were ready and ripe for picking on December 10th last year, but this might change next season depending on the climate. The farm opens all year-round from 9 AM to 6 PM, but it’s best to give them a call or message them over Facebook to make sure they’re open, especially if you’re visiting outside of strawberry season. We went on a Sunday and there were less than a dozen people there which makes for a fantastic crowd-free day. 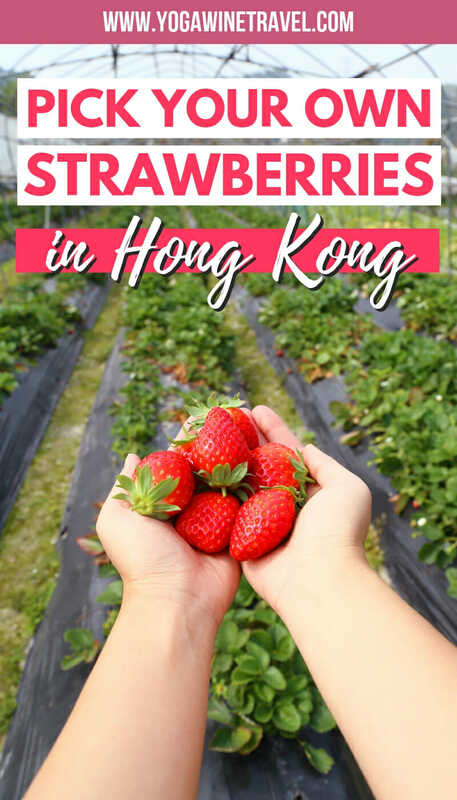 Entry costs HK$10 (approximately US$1.5) and you are given a basket and a pair of scissors – from there, wander around their strawberry patches and get picking. 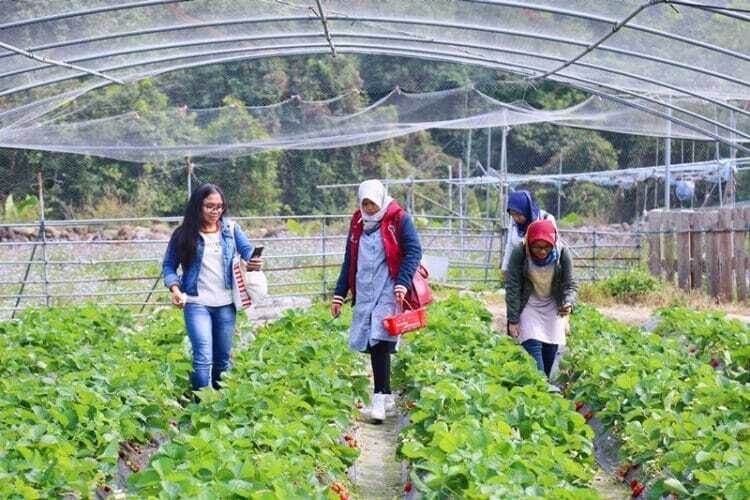 The farm charges for strawberries by the pound – HK$70 or just under US$10, which isn’t the cheapest but they are organic and extremely sweet, plus you’d be supporting a local family-run business! I ended up taking over a pound of strawberries home. Bring cash as I didn’t see any credit card facilities. The farm also grows tomatoes, corn and other vegetables. There are picnic tables on-site if you want to bring your own lunch, and plenty of clean toilets. 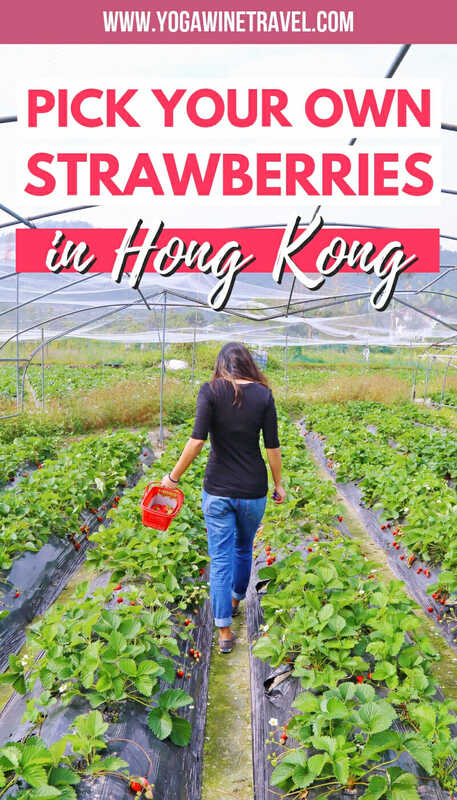 While it’s not the easiest place to get to, picking strawberries in Hong Kong at Rainbow Organic Strawberry Farm is a fun day trip if you’re looking for a unique experience that most people don’t even know about. There are a number of other organic farms in Hong Kong that you can visit, here is a list for other ideas. 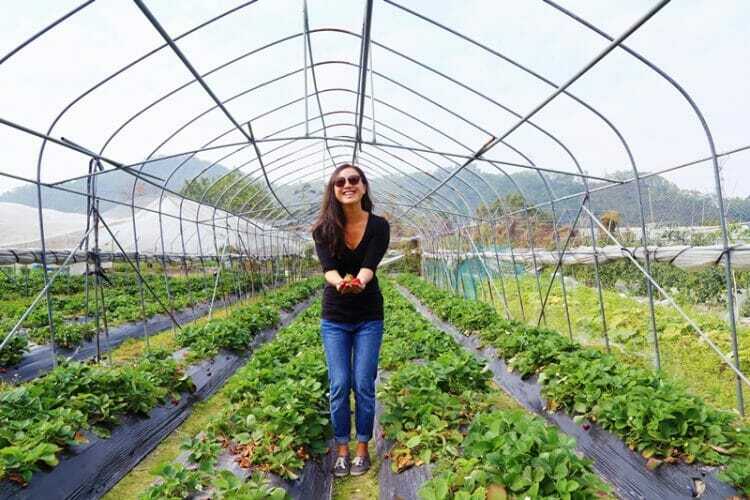 As you can see, I’m easily amused and strawberry picking in Hong Kong made for a seriously fun backyard travel day. 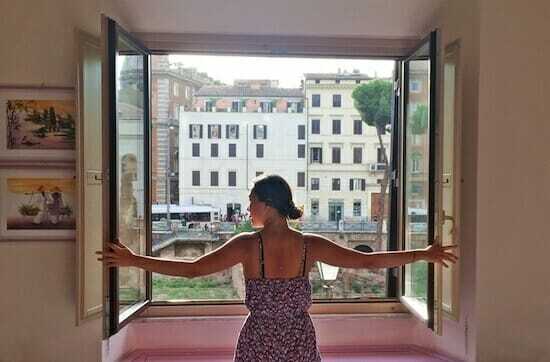 Goes to show – you don’t have to hop on a plane or cross international borders to travel and seek out new experiences! Planning a trip to Hong Kong? Book a hotel in Central, Soho, Wan Chai, Sheung Wan or Causeway Bay – these neighborhoods offer easy access to public transportation and there are plenty of restaurant options nearby. Click here to book accommodation in Hong Kong or head on over here for even more Hong Kong insider travel tips and destination guides!